I’m always eager for a good read and get ecstatic when I find one. There are so many possibilities out there that I try to choose wisely, usually from several sources such as NPR, The Times Literary Supplement, and my favorite with its nearly 200 reprints of notable works, The New York Review of Books. The latter is the source for my newest read, Patrick Leigh Fermor’s standout travel saga, A Time of Gifts (1977). I’m embarrassed at missing out on Fermor these many years, liking travel narratives as I do, but then that’s why I keep the NYRB close-by. Fermor was just an amazing guy in explorer Sir Richard Burton mold, fiercely independent, assertive and bold; linguistically gifted, courageous and cunning. Joining the Irish Guards In World War II, he fought in Greece and served with a guerrilla unit on the isle of Crete, where he disguised himself as a shepherd for 18 months, living in mountain caves, while successfully master-minding the abduction of a German general. 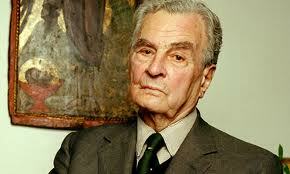 He was knighted in 1994, for his service to literature and promotion of British-Greek relations. In A Time of Gifts, Fermor begins his recall years later (age 62), of his three year walk across Europe to Constantinople as a 19-year with little more than a backpack in 1933. He actually only gets half-way by the close, and so there’s a sequel, Between the Woods and the Water, but even then, you don’t get to the Bosphorus. It little matters, for what we have is splendid, as we follow this young man hobnobbing with rich and poor, gypsies and priests, occasionally sleeping in ancient monasteries. His account of Germany in 1933, which saw Hitler becoming Chancellor, fascinates. On one occasion, he strays into a beer hall filled with Nazis. What attracted me to A Time of Gifts amid a plethora of can’t go wrong choices were multiple reviewer comments on Fermor’s stylistic talent, one reviewer likening him to Sir Thomas Browne as the best of the best prose masters across the several centuries. As a former teacher of English for some forty years, I’m an aficionado of style, or the mastery of the cadence of the English sentence. Talented writers know the weave of sentences spun into art, exemplary in the literary world, especially in the 19th century in the likes of Newman, Ruskin, and Pater. The gables of the Rhine-quays were gliding past and, as we gathered speed and sailed under one of these spans of the first bridge, the lamps of Cologne all went on simultaneously. In a flash the fading city soared out of the dark and expanded in a geometrical infinity of electric bulbs. Diminishing skeletons of yellow dots leaped into being along the banks and joined hands across the flood in a sequence of lamp-strung bridges. Cologne was sliding astern. The spires were the last of the city to survive and as they too began to dwindle, a dark red sun dropped through bars of amber into a vague Abendland that rolled glimmering away towards the Ardennes. Informed mastery like this, housed in rhythmic sentences acute with colorful detail, sets Fermor apart as one of our greatest travel writers since John Ruskin. You can read more about him in Artemis Cooper’s magnificent biography (2012). Having full access to his papers, she tells us that Fermor left behind a completed draft that gets him to Constantinople and that it will be published soon. Despite losing some of his sight and hearing, he remained active almost up to the day of his death at age 96 in 2011. In a book he had been reading, he wrote: “Love to all and kindness to all friends, and thank you for a life of great happiness.” Now that’s an epitaph we can only envy. This entry was posted in Books, People, Reflections and tagged Bosphorus, Constantinople, John Ruskin, New York Review Books, Patrick Leigh Fermor, Thomas Browne, Time of Gifts, Times Literary Supplement. Bookmark the permalink. A really nice review. You’re reading this great book at the right time! Assuming you race through “Gifts” like I did and then get further entranced by volume two, “Between the Woods and the Water”, this’ll leave you perfectly poised to enjoy the posthumous volume three, “The Broken Road” which as you rightly say is to be released soon: September 2013 in fact.